When I first visited Portugal, the dictator Antonio de Oliveira Salazar was still alive. Very old, he had ruled his country with an iron rod for 38 years. He had stabilised the currency but never trusted his people to develop and be free. With great power and long tenure, often comes a failure of judgement because few dare to tell truth to power when they know what may happen to them. To find out what wrongs Salazar committed and when how they were 'righted' – at least in a small way - click here. Salazar had kept his country virtually cut off from the rest of Europe. Unlike Spain, which saw financial advantage in encouraging tourism, Portugal did its best to keep people out. The news was censored and propaganda fed to the people. I used to listen to the regime's once-a-week broadcast in English and remember well the 'catch phrase' which appeared several times in each programme: "The fact of the matter is..." as it tried to explain away the repression forced on its people. The dictator's greatest error of judgement, which resulted in thousands of wrongs, was his refusal to admit that the time had come for the Portuguese colonies to be freed. Of course England and France had both been reluctant to release their own colonies – Russia still hasn't completely done so – but other European nations eventually accepted the right of different peoples to self determination and arranged independence celebrations. Salazar, however, trying to hold back the tides of history, declared the colonies to be Províncias Ultramarinas – Overseas Provinces - an integral part of Portugal, a fiction no one but he believed. He also legislated for all young men to be the property, not of themselves, but of the army and throughout the 1960s he shipped them overseas to fight vicious colonial wars in Angola, Mozambique and Guinea Bissau. 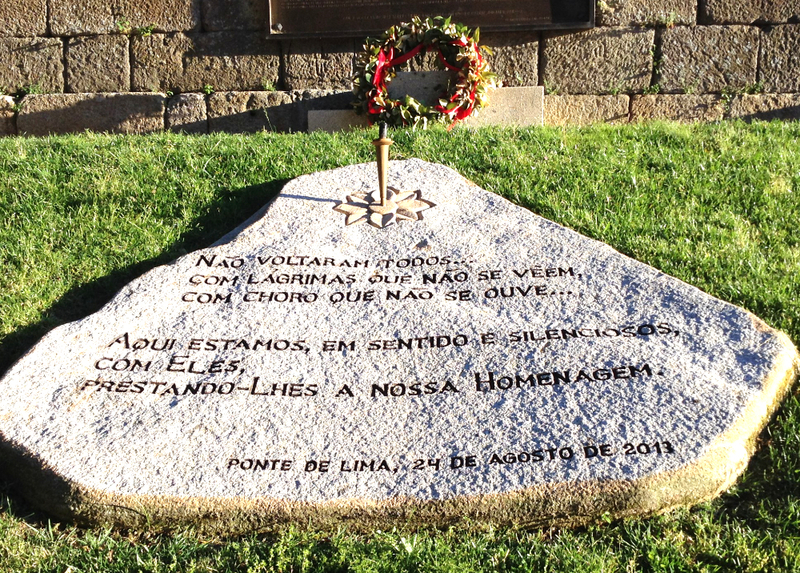 Thousands of people died, both African and Portuguese, but unlike those lost in the two World Wars, for decades there was no public memorial to dead Portuguese. Even though the world thinks those were illegal wars, the young men were not to blame. For them there was no choice. I know because I was a student then and I mixed with Portuguese students at Lisbon University who were looking for ways to escape. Where could they claim asylum? Could they find a way across hostile Spain, which would return them to an uncertain fate if they were caught? Could they find a foreign wife, giving them another nationality and home? Few made it out. Most, against their wills, had to go to war. 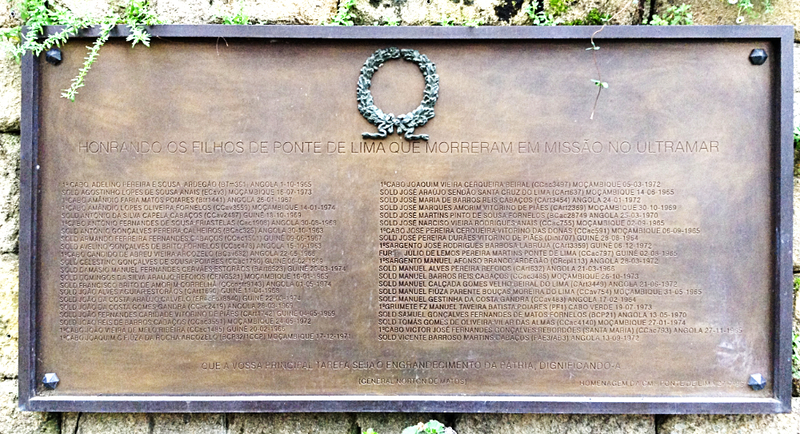 From this plaque in Ponte de Lima it is clear that they were mostly ordinary soldiers with a scattering of corporals and sergeants. Ponte de Lima 24th August 2013. Just think for a moment of that. From the mid-1960s to 2013 the sacrifice of young men from villages and hamlets, who knew nothing of war - whose lives up till the age of 18 had been school and farming through the changing seasons - went unrecognised. Families bore the loss in silence. Now, at last, the nation remembers those young men whose futures were lost because of the hubris of one cruel, ridiculous man.